Texas… commonly known as ‘Tyeeehxaas’, the largest of all 48 of the contiguous U.S states, with a shape so distinctive it barely resembles anything other than itself. I once saw a nacho chip that had broken in the bag in a way that made it look like a little like Texas, but that’s about it. Regardless, here is a state which has always intrigued me somehow, predominantly because it’s one of the ones we hear about the most over here in Europe. For the most part, our view of Texas is a stereotypical one. We might envisage the likes of Desperate Dan tussling with buffalos amongst phallic-shaped cactii stems in a deep-orange desert whilst an elderly man with a thin grey beard down to his chest sits on a wooden porch strumming out a countrified ‘waaaaaah’ sound on a guitar, pausing every now and again to sip fresh cold lemonade from a pyrex jug, the ice cubes sliding through the gap in his teeth and rattling down his gullet. Alternatively, a more contemporary conception may be of a group of devoutly conservative Christians spilling out in their hundreds from suburban churches situated upon an avenue of large houses and white picket-fenced lawns. We spent only two days in Texas and whilst I hear the landscape and religious demographics may match the above visuals in other regions of the state, I would also say that Texas is a whole lot more diverse than one would expect. Certainly, there were several extremely apparent differences between the two cities we visited in our short time there, and Austin in particular barely matched my stereotypical perceptions at all. We didn’t see much, but what we did see… or more, what we felt there, I quite liked. We headed here from neighbouring Louisiana on an overcast morning in November 2009. 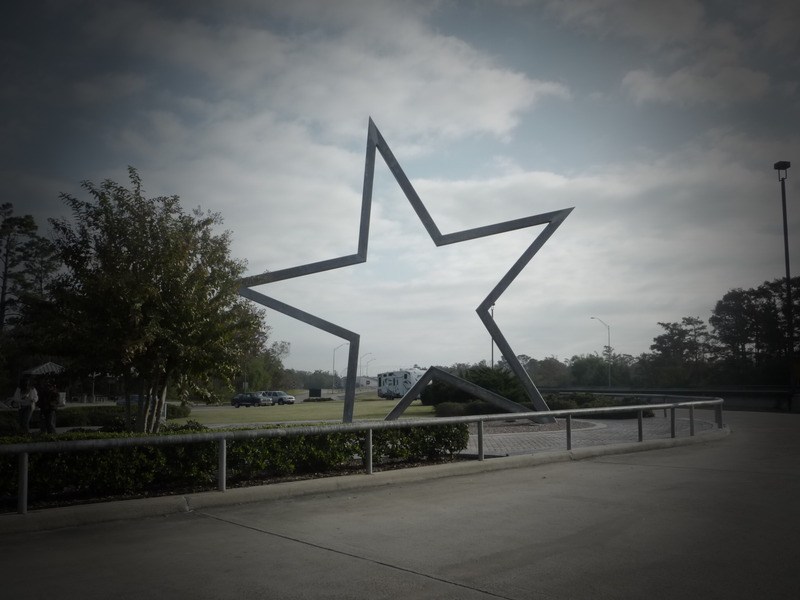 Our relationship with Texas started by stopping off in a lay-by at which stood a tall construction in the shape of a star. “Texas is also known as the ‘lone-star state'” Mandy educated us, “the symbol represents its independence from Mexico”. The star also made for a good photo opportunity, and whilst capturing it I was also amused to notice a nearby highway sign which read, “Welcome to Texas. Drive friendly – the Texas way” – such colloquialisms so typical of Americans! Our first Texan destination was also it’s capital – Austin, the 14th most populous city in the whole country though I cannot claim to have felt as though I was in the midst of such a massive metropolis. The skyscrapers were there but there didn’t seem to be many people around. Austin actually felt more like a large University town, which is often a good thing when you only have just the one day to spend there. Mandy dropped us off on South Congress Avenue, just south of the Colorado River which cuts through the city. It had a somewhat beachy feel – the shops were all low rise and the colour of sand, like surf shops along a sunlit shoreline. 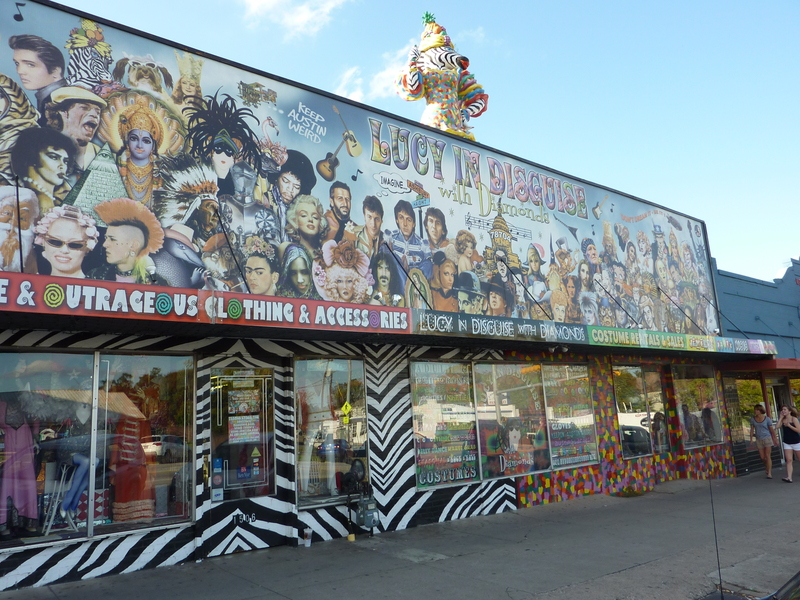 They were predominantly quirky – exemplified by the craftily titled fancy-dress shop, ‘Lucy In Disguise With Diamonds‘. Another shop, called ‘Uncommon Objects’ sold… well, uncommon objects. I guess in Britain we’d just call it an ‘antiques shop’ but this was certainly no ordinary antiques shop. It had everything ranging from the weird to the wonderful, and it also had a customer inside whom the others seemed to know very well – James Lafferty from One Tree Hill, although I had no idea who that was so didn’t enjoy the moment of recognition quite as much as the others! On a personal level, I probably remember Austin mostly because of the tattoo I acquired there. Bella and I had been discussing having one done for several days, as a memento of the trip, and had heard that Austin was one of the best, most reputable places to have it done – I guess partly due to the busy alternative scene. Generally speaking, Austin had a very dry, alternative, rock’n’roll feel, probably compounded by the knowledge that its often considered to be The Live Music Capital of the World. 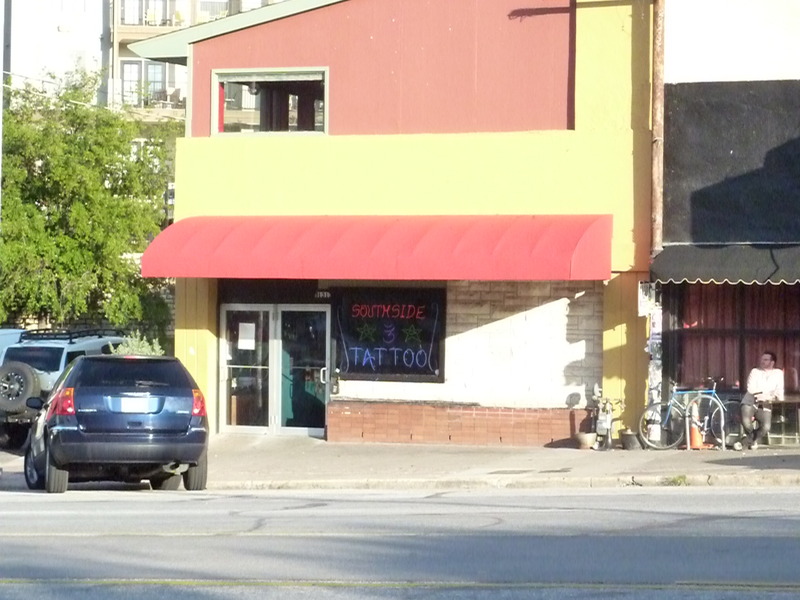 We strolled into Southside Tattoo Parlour where a James Hetfield double was stood behind the counter in a black metaller t-shirt with arms like topographic maps, so extensive was the detail of his bicep body art. Obviously with no prior booking we were unsure of his availability but given the simplicity of our designs, he was happy to slot us in at short notice. Siobhan joined us for moral support. Bella had a tattoo of a flower on her wrist, and I opted for some musical notes on my lower-back. Music, to me, is the solution to everything. It gets me through the hard times and helps me enjoy the good times. There is never an emotion which can’t be complemented with a song, and I wanted something to represent and remind me of that, though now the tattoo mainly symbolises the good times in Austin, and America in general. I’m happy to have the permanent reminders of my times in America and Indonesia on my back. Although I hadn’t realised that there’d be blood! After the tattoo was finished I had to walk around with a cotton wool on my back, which made for an interesting afternoon of sitting carefully and not leaning back on anything! 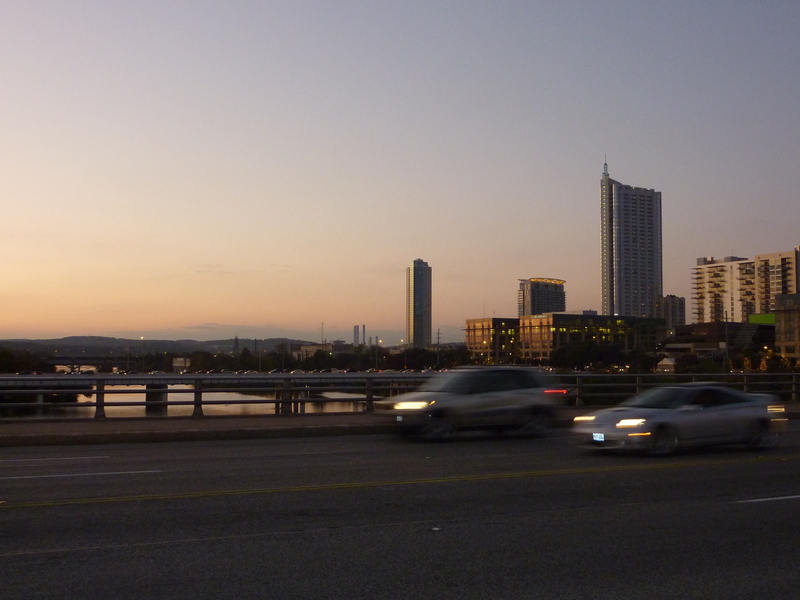 By this time it had almost reached sunset and Mandy had gathered us up on Congress Bridge facing East to see the infamous ‘Bats of Austin’. For a large portion of the year the underneath of the bridge is home to thousands and thousands of Mexican free-tail bats who have migrated North to give birth. Each night, as soon as the sun has set and dusk descends to form a night sky, the bats flee from under the bridge in droves, and fly out to look for food. It’s one of the ‘must see’ things to do in Austin apparently, and we weren’t alone on that bridge as we stood waiting. For ages. And ages. And ages. And ages, in the deceptively cold remains of the day’s sunlight, desperately trying to hurry the dusk along! “There’ll be thousands!! !” – Mandy did her best to keep us engaged as conversation slowly turned from bat anticipation to other matters, such as where to go for dinner and how James Lafferty had been in a shop up the road, and finally within a few minutes we got our first glance of night sky and heard the early shuffle of bats making a move! I think that’s a bat! There’s another bat! Is that one there, too? Wait, I can’t see very well, it’s too dark to see a damn thing. Is that a bat or a bird? I know, I’ll take a photo on my camera, perhaps they’ll show up under the flash. It was like this for around 10 whole minutes before a deflated Mandy conceded matters, “Uhh, I guess this is it”. The display of bats had been underwhelming to say the least – we had anticipated seeing thousands but in reality we saw barely even a hundred. We later realised that it was maybe too late in the year to see so many bats. Despite the disappointment I couldn’t help but find the whole thing hilarious – there we had been, armed with cameras, pressed up against the railings waiting in the cold for what felt like an eternity for the sun to set, only to then witness a slow trickle of bats emerge from the bridge whilst frantically debating with one another whether or not that sole moving shadow below us was actually a bat or a bird. That night we went to eat in a restaurant called Threadgills where none other than a young Janis Joplin had performed one of her first ever gigs some 50 years or so earlier. It also had the most delicious corn muffins I’ve ever tasted, served warm with butter. To this day, I still think about that muffin. Afterwards, Vicky, Lauren and I went for a beer at a bar in town where a rock band was performing. We didn’t stay out long, but it was nice to soak up the atmosphere and music, particularly in a place that has been so significant for music over recent decades. 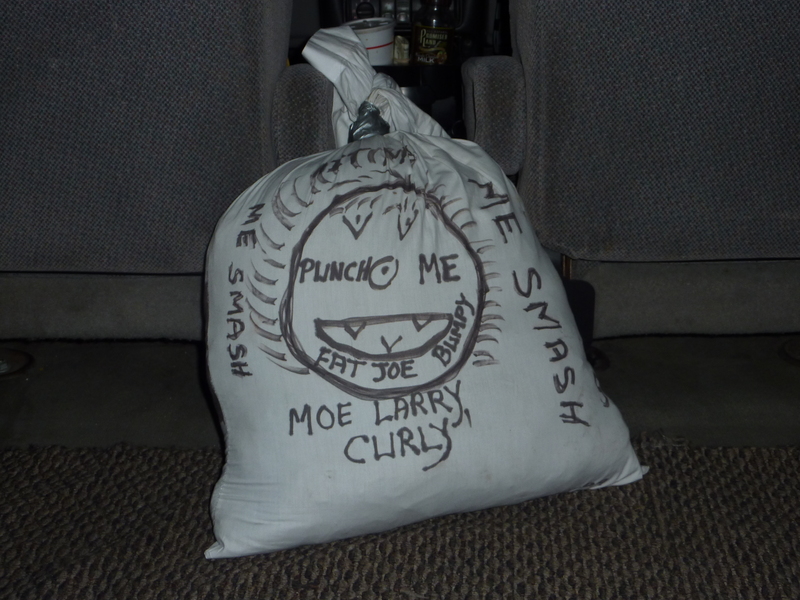 We took a taxi home driven by a man who kept a punching-pillow on the back seat. The pillow had a face drawn on it, and the character’s name was ‘Fat Joe Bumpy’. The taxi driver, a plump man with a high, squeaky voice who pronounced his ‘s’s like soft j’s, enjoyed explaining the purpose of his assistant. “It’s for the angry drunks who take my cab to punch!” How could anyone want to punch innocent little Fat Joe Bumpy though, I thought to myself. We were staying in a Hostel International that night and all of the group had been able to fit in one room. The sound of snoring as we entered the room caused Vicky and I to have to exit the room hastily in fits of giggles. Unfortunately, we never quite got around to identifying the perpetrator! The next morning we set off for Lubbock. This was probably the least interesting of all the stops, but it was nice to see a bit more of Texas, particularly an area of it that wasn’t quite as metropolitan as Austin had been with it’s huge skyscrapers and capitol buildings. Lubbock was much more remote and our journey there had taken us through little more than wide open plains of cactii and telegraph poles. Lubbock is predominantly low-rise with pinky-beige buildings and it almost looked like we were making our way around a number of upturned cardboard boxes which had been arranged in a neat and perfectly parallel layout as opposed to an actual place where 230,000 people live. 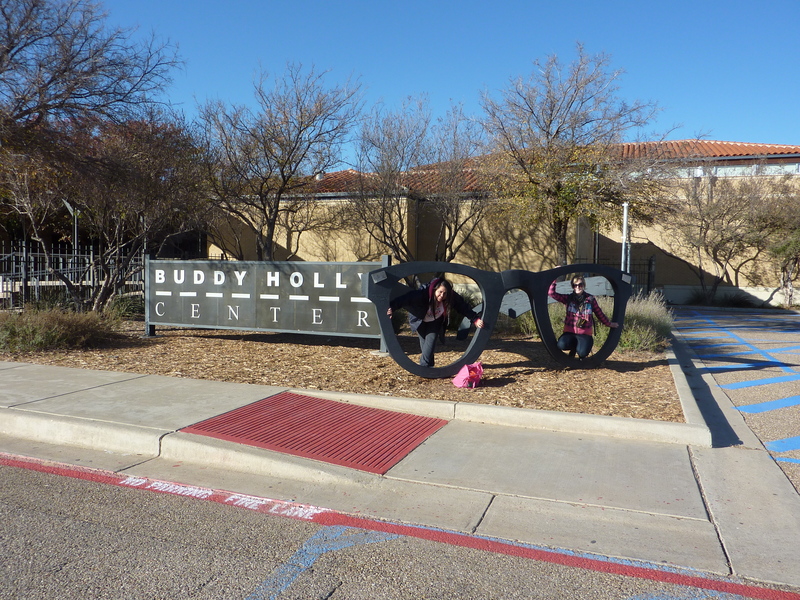 Lubbock’s main claim to fame is that it is where Buddy Holly was from, and this constituted the main theme of the afternoon as we made our way to the Buddy Holly Centre and learnt all about the young singer’s short life. Similar to the Elvis Effect that some of us had experienced in Graceland, it was interesting to suddenly become immersed in this person’s life who’s music I had never really paid attention to before. The saddest exhibit of all was his infamous black-rimmed glasses which had been recovered from the debris of the plane crash that had killed him back in 1959. After this, we went and tried some wine tasting in an outlet where upon hearing of our journey the lady conducting the session remarked that we had probably been to more U.S states in the past fortnight than she had ever been to in her life. I remember feeling quite taken aback by the comment, and also extremely privileged that we had been able to come here. For dinner we ate in a Mexican restaurant where everything was served with re-fried beans, and I had some kind of meat in a bright red spicy sauce. The entertainment that evening came in the form of a trip to the cinema. The new Twilight movie had come out and many members of the group were dying to see it. Those of us with taste opted to see Planet 51 instead and I just remember laughing non-stop, particularly at the motion with which the 3D characters walked.